"Cook Me Somethin' Mister!" 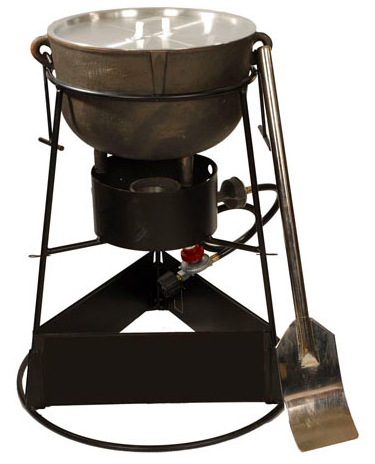 is a subsidiary of ADGAS Outdoor Cooking Products, based in New Orleans, Louisiana. 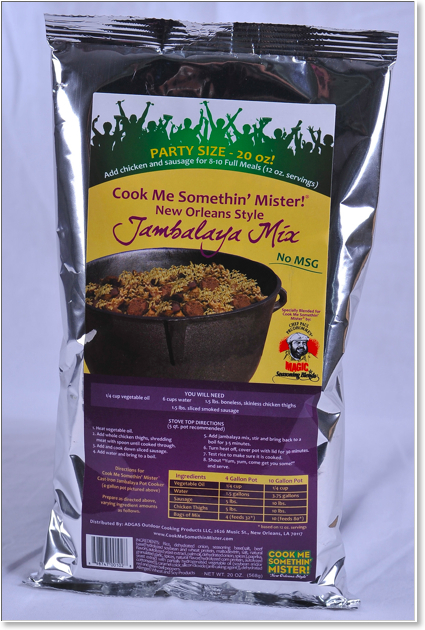 Recently, they sent me a 20 oz "party size" package of their New Orleans Style Jambalaya Mix to try out. The mix comes with everything you need except for the meat, cooking oil and water. The directions suggest 1 1/2 lbs. of skinless chicken thighs and 1 1/2 lbs. of smoked sausage. 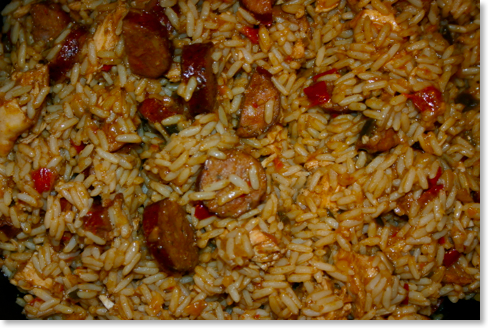 Of course, if you're already familiar with jambalaya, you know that just about any meat or seafood combination can be substituted. In my case, I grilled some chicken breasts, which I chopped up afterwards, and substituted andouille sausage for the smoked sausage. The recipe also calls for "a five quart pot." I used a Lodge Logic 5 qt. Dutch oven which worked perfectly. The directions, which are printed on the packaging, were simple enough. After the meat was cooked in the oil, I added water and brought the pot to a boil. While boiling, I added the mix and boiled this for 3 to 5 minutes. Then, it was just a matter of waiting. The stove's heat has to be completely turned off and the food sat covered in the dutch oven for 30 minutes. Although the next-to-last step suggests testing the rice to make certain it's done, it was for us. The only remaining step was number 8 requiring the cook to "Shout, 'Yum, yum, come get you some!'" which I did, bringing both Kathy and Bessie Mae (our hound dog) running. Unfortunately, Bessie Mae did not get any. 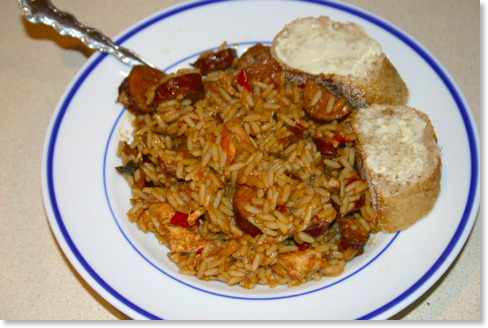 I've eaten and made many jambalaya recipes in my life and I have to admit that this one was right up there with the best of them. It's easy to be skeptical of a mix, but this one had the flavors right. Maybe part of it was Chef Paul Prudhomme's Magic Seasoning blended in--a fact advertized right on the label. I think another reason why it was so good is that unlike many mixes I've tried in the past, this particular one used vegetables large enough to see, bringing out a much richer flavor. As you can see in the close up above, red and green bell peppers are easily identifiable as well as onions. The flavor was rich, and full, and my guess is that the average person would not even consider that it might be a mix. The package advertizes that once chicken and sausage is added, there's enough food for 8-10 full meals. I would say, that and maybe more. We also gave some to some friends of ours without telling them it was from a mix so as to get an unbiased reaction. They thought it was wonderful and were actually surprised when I told them it was a mix. One might ask, "Why use a mix anyway? Why not use a recipe from scratch" That's a fair enough question. But if you've ever made any Louisiana dish, you know that most of them aren't created in 30 minutes or less. And truly, even the jambalaya mix from Cook Me Somethin' Mister is going to take about an hour in total time once your meat is cooked, too. However, even that is at least an hour shaved off the normal time that jambalaya takes. But there's even greater reason to use this mix in a whole different context. Cook Me Somethin' Mister also sells a 4 gallon or 8 gallon cast iron jambalaya pot and burner combo. The four gallon combo requires 10 lbs. of meat total and 4 bags of the jambalaya mix. The ten gallon setup uses 10 bags of the mix and 20 lbs. of meat. These will produce 32 and 80 servings respectively! What would you use this for? Well for tailgating parties, campouts, and any other event where you might need to feed a whole lot of people. 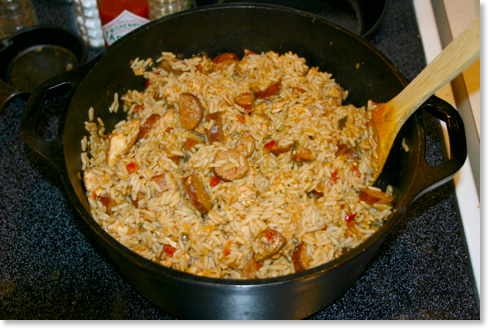 I think this would be great fun to cook this huge cast iron pot of jambalaya for a large group of friends. The good news is that you don't have to fix multiple gallons of Cook Me Somethin' Mister New Orleans Style Jambalaya to try it. You can start with one bag which will be enough for your family, maybe a couple of friends, and who knows--you might even end up with leftovers!